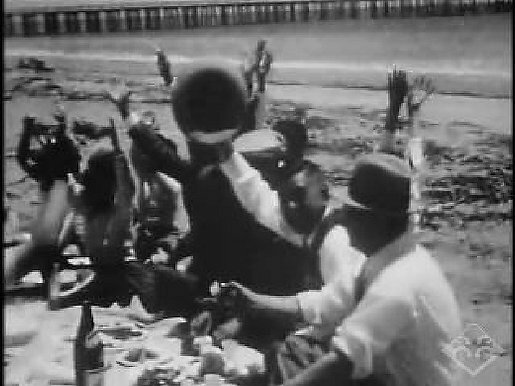 Black & white silent amateur footage of family and business activities of Setsuo Aratani (1885-1940), filmed 1926-1940. DVD 3: Includes footage of a picnic at the beach, people playing guitars, dancing and singing, the Guadalupe Produce Co., footage from a family trip to Yosemite National Park, Setsuo Aratani's Buddhist funeral and motorcade, a large family or company picnic, children playing, a stage or bandstand presenting various activities, the Guadalupe Produce Co. and related produce activities such as packing crates, loading trucks, and footage of wide open croplands (60:31). Credits: Setsuo Aratani Collection, Gift of George Aratani, Japanese American National Museum (2004.67). Preserved and made accessible in part by a grant from the National Film Preservation Foundation. HNRC — Última actualización Jul 25 2016 2:19 p.m.